FC Bayern Munich: a name synonymous with success; a brand behemoth renowned the world over. From modest beginnings to instant global recognition, the story of the rise of Germany's most decorated team is a fascinating tale, befitting of one of the Bundesliga's greatest ambassadors. And the names that fill the cast of this special Bayern script are as numerous as they are gilded with glory. From Franz Beckenbauer to the recently retired ; Gerd Müller to Thomas Müller, Karl-Heinz Rummenigge and Lothar Matthäus to Manuel Neuer and Robert Lewandowski. A recent tweet by the club revealed that the Bavarian giants – founded in 1900 – boasted 277,000 members, making them the world's best supported club in terms of fan membership. It is quite a feat, considering that Bayern were once considered the southern city's second team, after 1860 Munich. Indeed, FCB were originally overlooked for entry into the Bundesliga when the division was formed in 1963. The authorities unwilling to accept two teams from the same city into the new German top-flight, it was the more successful 1860 Munich who were invited into the footballing elite. "I remember when I first got called up to train with the national squad, there were seven 1860 players there; that gives you an idea of the balance of power at the time," Beckenbauer explained of the disparity between the two Munich clubs. "But it didn't take us long to overhaul them, and the rest is history," Der Kaiser explained. Persistence certainly paid off for Bayern, and bolstered by the brilliance of Beckenbauer – originally an 1860 fan who held aspirations of playing for them – Gerd Müller and goalkeeper Sepp Maier, Die Roten soon rose to join the best. A phenomenal achievement of winning the Bundesliga and DFB Cup double – a national first in 1969 – arrived after the Bavarian side enjoyed European Cup Winners' Cup glory. The outfit founded by disgruntled members of a section of a gymnastics club at the start of the 20th century were on their way to becoming the dominant domestic and European force known the world over today. The 1970s yielded four league titles and an awe-inspiring three consecutive European Cups. With Müller in his pomp – even registering an as yet unmatched 40-goal haul in a single Bundesliga campaign – Bayern were unstoppable, winning admirers the world over and providing Germany with six players in the nation’s 1974 World Cup win. 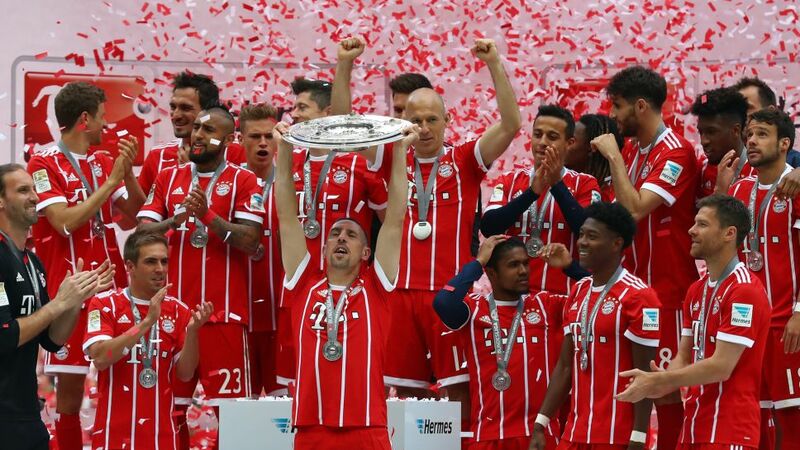 Fast forward to May 2017, and via a plethora of star players who helped to light up the world game and warm the hearts of fans, Bayern were crowned Bundesliga champions for a record 26th time. City neighbours 1860 also play in the magnificent Allianz Arena – inaugurated in 2005 – yet the status of both teams stands in stark contrast to those bygone days. A friendly offer of assistance saw Bayern buy 1860's share in the stadium to help their ailing rivals through a period of financial difficulty in 2006. Supporters also hail the record 18 German Cups and five European Cups/UEFA Champions League titles raised aloft by Bayern – which includes the 2012/13 treble won under the guise of Jupp Heynckes. The current crop at Bayern are filled with players developed at the club's youth academy on the famous Säbener Strasse in Munich, a performance centre inspired by former Bayern striker and coach Jürgen Klinsmann. Represented within Germany’s 2014 FIFA World Cup winning squad, the likes of Toni Kroos, Lahm, Müller, Mats Hummels and Bastian Schweinsteiger came up through the ranks with the Bavarian giants. Operating under the 50+1 rule, a DFB condition laid down to ensure that a club's members must own the majority of voting rights, Bayern's superbly organised structure is also highly supporter friendly. Sell-out attendances at home games is the norm while fans also flock to see the current Bundesliga champions at away games too – most venues are at capacity when the record champions are in town. Balanced entry fees ensure that die-hard supporters are not priced out of attending games. With homegrown talent combining with international greats like Poland's super striker Lewandowski, Chilean midfielder Arturo Vidal, wing wizard Arjen Robben of the Netherlands and France prospect Kingsley Coman, to name a few, Bayern are set fair to remain a Bundesliga force while maintaining their place at the top table of European greats. From their humble beginnings, the red rise to the top represents one of world football's greatest success stories. "FC Bayern are in a very good situation in both a sporting and financial sense and have established themselves at the top of European football. We'll all continue our work to ensure we remain successful at this level. FC Bayern are a wonderful club," former Bayern winger and board chairman Karl-Heinz Rummenigge commented last year.